Ari (arisia.vita)'s RezDay finally came around on October 18 and it's not just any RezDay. It's Ari's 10th RezDay. It happened on Wednesday. I went to Ari's concert on Perfect Paradise (131,152,22). It was amazing. Ari started his concert by greeting everyone. I then reminded him it was his 10th RezDay. "Hello, both of you ..and happy Res day, Ari, whether you celebrate it or not (smile)." said Gaia Maria's alt, Mariaseconda. "Thank you Gaia," said Ari, wishing her hugs. "*hug*. I'm always happy to celebrate any special days, including other people's (grin) So, chocolate for Gaia today, in honor of Ari~!~" said Mariaseconda. I asked people around the piano what they thought of Ari's music. "Ari's music calms me and takes my mind off of my worries." said Jonquil Gal (esthezia.andel). She likes to dance to Ari's music. "He has gotten a lot of my smiles." said Jonquil Gal, smiling. Ari would only accept tips in smiles. I asked him if it's true that if someone tries to tip him, he'd return the tip to them. "Yes, with thanks." said Ari. "I love this dreaming music... always.." said Helge Janus. "Ari gives us a special gift with his music." said Jonquil Gal. "It's a peaceful event," said R0bin Helsinki,"Tunes in paradise." "I just reflect the gifts around me." said Ari. "Ari was in his usual splendid form, both musically and fashion wise." said Caya Corvale. "It is always a pleasure to listen to the music he chooses. A generous mix of classical and popular melodies." "Always a pleasure to have you in the audience." said Ari. "His talent is amazing, and Ari is one of the most wonderful, charming, kind people I have met in any reality," spoke Mariaseconda. "I am honored." said Ari. "I wonder how the piano can still make such lovely sound with plants in the case." said Carla Broek. "It's magic." said Ari. Carla continued, "Well up until now no wildlife or children have been hurt. And he sits very still, not making any sudden moves that might spook people with nervous reactions. So I would say it goes well for him at the moment. ...It's great. And I love how he can play and chat at the same time." "I have some great help." said Ari. "Ari *always* finds lovely music for all of us ...and I swear he is telepathic ... knows just what I need to hear at any given moment :)" said Mariaseconda. "One of my fondest memories when I was very young was lying on the couch in the living room listening to my older brother play the piano." said Ari. "I think it affected me." When the concert ended, people thanked Ari for his wonderful music. To this day, Ari is a really good piano player who cares a lot about the others. That's who Ari is. I later got together with Ari during the concert at Cape Heron. As it turned out, Ger Y Lli was the first place for Ari to play his piano several years ago, thanks to Yavanna. Soon after that, Ari started playing for Cape Heron. "The desire to help others." said Ari when I asked him what inspires him to be a piano player on Second Life. 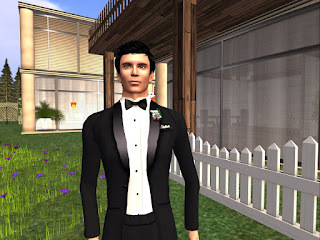 When asked if he would continue playing for a long time on Second Life, Ari said, "As long as others enjoy it, I will." We talked about the park in Ari's honor on Cape Heron. I asked him if he is aware that there is a park in his honor. "I am and I love it, it honors me." said Ari. He is also aware that the owner of the park is planning on keeping it for a very long time. It pleases Ari to know that the owner is keeping the park for a very long time. Ari said that he's not surprised that someone wants to interview him on his 10th RezDay and also know now that he is an inspiration for many pictures that someone took of him. Mister Rogers is Ari's role model. He asked me if I knew Mister Rogers and I told him that I knew him from 1980's. Even when there was no subtitles on TV at that time, I still knew Mister Rogers. It was my favorite TV show. When we said goodbyes, I left with a smile on my face. Ari isn't just an inspiration. He is a role model, too. That's something to know about a piano player who would continue to play music as long as the others enjoy it.